The System consist of interacting communities and societies, and of their interactions with their respective environments on which they also depend. 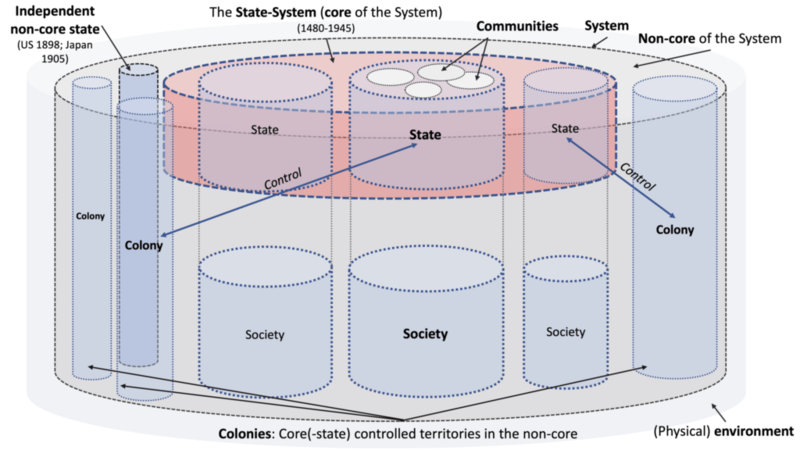 State-structures represent and regulate societies in the State-System and System. Humans can be considered the ‘elementary parts’ of the System. The environment of the System is more than just physical and also contains a virtual ‘component’. The System has a hierarchical structure as defined by Simon (77). The System is an open system. Anatomy of the System (1). Anatomy of the System (2). • Individual humans constitute the elementary parts of the System. • Communities are collections of humans that serve certain purposes, like tribes and businesses. • Societies, consisting of individual humans, groups, communities, etc. • States (also referred to as state-structures): States are organizational structures that regulate societies and represent societies in the (State-)System; societies constitute the internal environment of states, while the State-System constitutes the external environment. • The State-System: The State-System consists of a network of states. Interactions between states in the State-System, are regulated by formal and informal rules. During the transient period (1480-1945), the core of the System (Europe) constitutes the State-System, I also refer to as the European State-System. Although in 1898 and 1905 the United States and Japan acquired Great Power status (48), the non-core did not constitute a coherent (non-core) State-System (until after 1945) and was mainly controlled by European (core states). The State-System is the structural appearance of the FTS. • State/society-specific environments: Each state/society has its own environment on which it depends; The society can be considered the internal environment of a state. • A shared (physical) environment: All systems share a (physical) environment on which they depend (the ‘climate’ is part of the physical environment). • The System: The System consists of interacting states and societies and of the environment on which they depend. • The core of the System: During the transient period 1480-1945, Europe constituted the core of the System. • The non-core of the System: During the transient period 1480-1945, the ‘rest of the world’ (non-European states, societies and communities) constituted the non-core of the System. The System is a nonequilibrium System that is pushed and sustained FFE (by the FTS): Societies (states) are social systems (networks of communities) in local equilibrium in the otherwise nonequilibrium System. Social systems – the FTS, State-System as well as societies and communities – require EMIS-regulation, to ensure their viability. 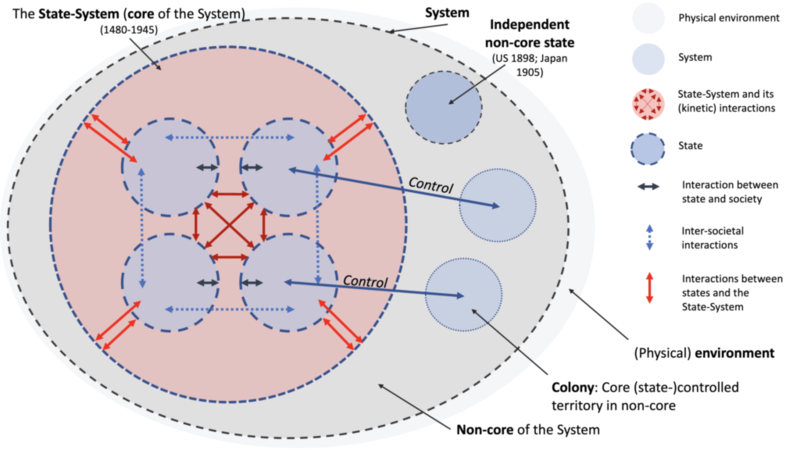 The State-System can be considered a subsystem of the System. Sometimes, I use the term (State-)System when there is some ambivalence; for example, when it is not clear if an issue or property that is discussed applies to both. The use of the term ‘State-System’ always concerns the core of the System (Europe) if not stated otherwise. Source~: On the Thermodynamics of War and Social Evolution.